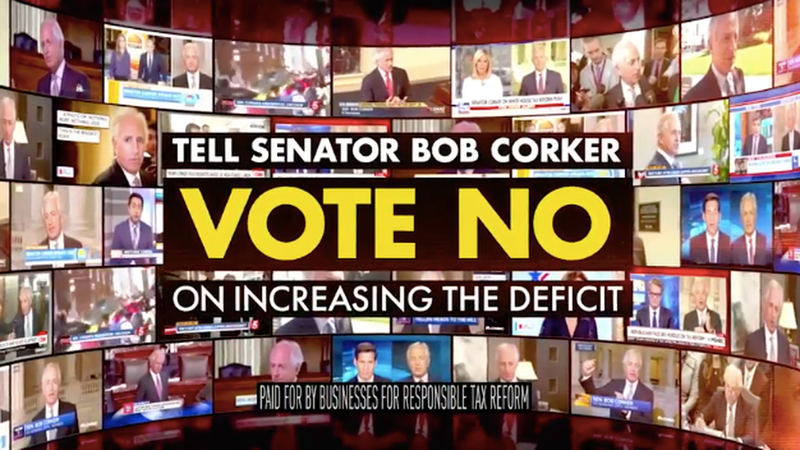 Screenshot from the BRTR ad against Sen. Corker. Businesses for Responsible Tax Reform, a coalition of small business leaders, will launch a six-figure TV campaign to oppose the GOP tax bill on the grounds that it balloons the federal deficit by more than $1 trillion. Per a source involved in the efforts: The first ads highlight promises by GOP senators James Lankford and Bob Corker to oppose any plan that increases the deficit. Why this matters: Polls show the Republican tax plans are unpopular — as Axios' David Nather has reported. But progressives know they can't rely on lackluster public opinion to sink the bill, given the extraordinary political pressure on Republicans to pass something before the end of the year. Democrats know they don't necessarily have the votes to kill the tax bill in the Senate. The path to sinking the bill in the Senate is through lawmakers like Corker, Lankford and others like John McCain who care about the deficit and debt implications. This campaign is the first time a progressive group has run advertising specifically calling out GOP senators on the debt issue, with the goal of making it harder to vote for the bill.